and learning to love exercise. This is her next installment into her adventure at going BE while raising money for the great cause of the Willberry Wonder Pony Charity. I bought a new horse! To be truthful my wonderful husband bought it for me and my lovely daughter actually went all the way to Coventry to try it out for me as I was hard at work. 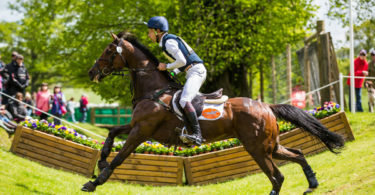 It’s not the usual way that I purchase a new equine but I trusted Polly, said daughter, to know whether a horse is right for her scaredy-cat, wanna-be-eventer mother. 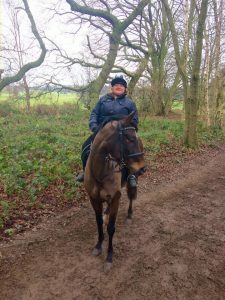 “She’s absolutely wonderful” came back the text, “if you don’t buy her I will- so sweet, an amazing jump!” So I did, and picked up a pretty, slightly bony, 16.1hh, tb x warmblood mare called Fran just 2 days later. Quick work Mrs C! Polly and I went over to Somerford Park in Cheshire to do the farm ride there the next day and Fran really did prove to be a sweetie. She’s a great deal different from my 15.1hh cob mare who likes to amble along at the back. Fran prefers to stride along and I found that I didn’t have to kick with every step, in order to keep up. Her canter is just lovely and she’s not at all strong in the mouth. I felt quite confident that I could stop her- big box ticked! I’m lucky enough to have a friend, Lisa Morris BHSI, UKCC Level 3 who’s a BE coach and is also on the National Development Programme for Coaching Excellence. She found me my last horse, has taught me for years off and on, so if anyone can help me in my Wobbleberry quest then she can- I hope! 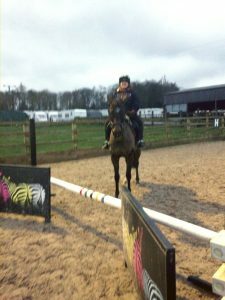 I attended my first lesson with trepidation- I really didn’t want to jump, was too scared, but Lisa explained that her priority was actually keeping me on top off my horse and not on my back in her school. Good plan I thought- I’ll take that plan and run with it- and I did! We had an amazing first lesson. “Head up and look between the horse’s ears”, “look at me and not down at the jump- your head weighs a stone” she said (see Lisa I was listening! )- and it worked. It didn’t look tidy and I was very wobbly but I did it- and cried with relief and joy that I didn’t fall off afterwards. The next lesson was more of the same, building on my confidence and just doing a few jumps of around 30cm- you may be chuckling to yourself but they seemed huge to me. Unfortunately, I had to take a week away from riding to Wobble down the ski slopes in France- well someone had to do it! I felt much fitter thanks to nice-man Phil working me hard at the gym and having lost an amazing 9lbs in my first month of the diet/ training challenge. Fantastic snow but dare I say a little too much, and it wasn’t always possible to ski due to visibility so I had to drink a little too much wine and eat far too much smelly French cheese and I ended up 4lbs heavier when I returned- I’m sure that’s not meant to happen on a skiing holiday! “Not to worry” says not-so-nice man Phil at the gym- “we’ll soon have that off” and he increased the intensity on the cross-trainer with a grin! Back to riding. Two days after my return from the slopes and the first time I’d sat on Fran since before skiing. I’m finding it difficult to find time to ride due to the dark nights, late work finishes and my gym sessions and I’ve still not got used to riding Fran- nor she to her new passenger. I admit to being scared at my next lesson with Lisa. It was really windy on top of the hill where she lives and I’d convinced myself that Fran really didn’t like it. She probably couldn’t have cared less but I felt wound up. The lesson proceeded as planned with me staying on board for the first few jumps over an absolutely tiny cross and then…….I think she got the message down the reins that I wasn’t altogether happy- ie, I was pulling on her mouth- and she stopped! Not a nasty stop, but I’d assumed the jumping position so I jumped and she didn’t. I went over her head and landed on my bum- sorry Lisa- I didn’t stay on top. Ouch- blooming big massive ouch! Off she went, bridle off (bad tacking up Mrs C) and I was left rubbing my large derriere whilst Lisa went to catch the horse. I admit to sobbing, it hurt after all and I felt a little as though I’d literally failed at the first hurdle. Still, I got back on, trotted off and came around and jumped a slightly smaller version of the offending cross before announcing that I’d like to leave it there for the day, please, thank-you very much! After a long discussion with Lisa, who, quite understandably, is wondering why I’m putting myself up for this challenge but is willing to help me to achieve it, it has been decided that I really need to get to know Fran a little better. Hacking out at the weekends. Grooming her in the stable so that we create a bond with each other. I’m hoping that I’m not the only Wobbleberry out there who is doubting whether she can do this challenge. 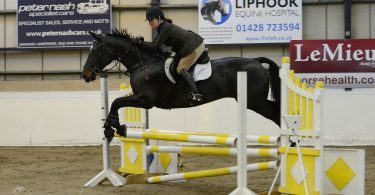 I helped at a ODE yesterday and the 80cm jumps looked huge. I don’t really know why I’m so scared of jumping when everyone else take it in their stride and doesn’t fall off. What’s their secret? I really need to know if I’m to progress in this challenge. March is just around the corner with lighter evenings and better weather. Fran and I will begin to form a proper partnership and I’m feeling quite positive that this has been just a tiny blip. I said that there would be highs and lows in this challenge. So February goes down as a minor low. March is going to be a little step up. I’ll let you know what happens in the next 4 weeks. I CAN do it and I WILL do it. Someone hand me the Sudocrem and Lisa the Valium. We may be needing them! 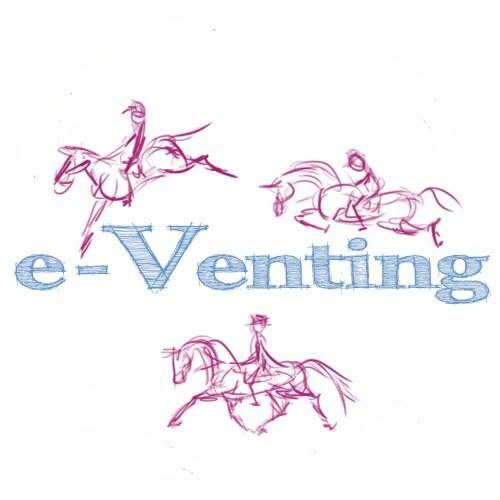 Teeth – Vet or EDT?